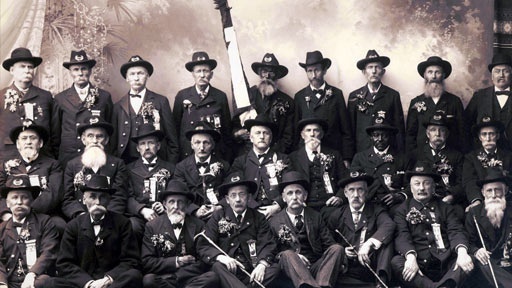 A Civil War enthusiast owns a striking vintage photograph that depicts about 20 older white men in full dress uniform, standing shoulder-to-shoulder with two black men. In Reconstructionist-era America, association between blacks and whites was frequently taboo. So what brought them together for this portrait? Their bond, it turns out, was the Grand Army of the Republic, a remarkable fraternal order organized for war veterans. In fact, integration was actually a GAR standard. The reason? The men had in common an affliction that transcended race – a struggle with post traumatic stress. History Detectives investigates the first national social group to challenge the color barrier. Cazenovia, NY and Washington D.C.
Also with Elyse Luray NC-4: First Across The Atlantic Is this piece of fabric a remnant from the first transatlantic flight? Also with Elyse Luray Connecticut Farmhouse Why did this Connecticut farmhouse have so many owners in such a short space of time? Related Investigation Woolworth Sign Were these signs part of the scene in an early victory for Civil Rights? Related Investigation Army Muster Roll What can a Continental Army muster roll tell us about this remarkable African-American soldier? Also with Elyse Luray Annie Oakley Coin Was this coin a target for one of the Wild West's most popular female sharpshooters? Also in Season 6 Blueprint Special Did this record play a dramatic role in the Allied victory during the Second World War?